Johnny Podres pitched for 15 seasons in the major leagues: Brooklyn Dodgers (1953-57), Los Angeles Dodgers (1958-65), Detroit Tigers (1966-67) and the San Diego Padres (1969). For his career, he won 148 games against 116 losses in over 2,000 innings pitched. 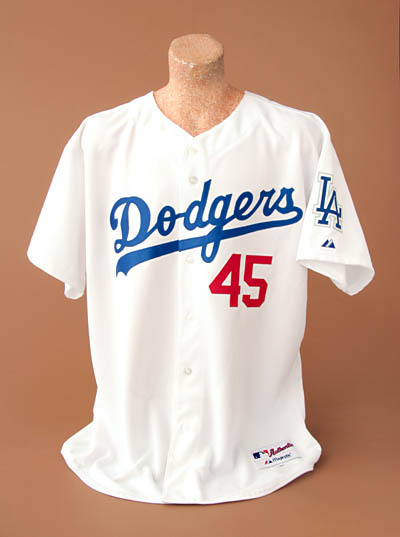 He is best remembered for his ’55 World Series feats that earned him World Series MVP honors. In the series, the 23-year-old Podres won Games 3 and 7 against the cross-town rival New York Yankees as the Dodgers won their first World Championship. He shut out the Bronx Bombers 2-0 in the decisive Game 7. 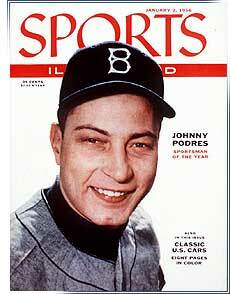 A three-time All-Star, Podres was named Sports Illustrated magazine’s Sportsman of the Year in 1955. In ’57 he led the National League in ERA (2.66) and shutouts (6). Johnny Podres was a bold, brash left-handed pitcher who complemented a sneaky fastball and wicked curve with just the right pinch of confidence to make him one of the most memorable starters in Brooklyn and Los Angeles Dodgers history. When he was 70-years-old he still flashed that engaging, carefree demeanor that sparked him to World Series immortality. “Pretty good” is an understatement. In 1955, when the Brooklyn Dodgers defeated the New York Yankees for their first World Championship, Podres was superb. In that classic World Series, Podres posted a pair of complete game victories, including a 2-0 gem in the historic seventh game. Podres jumped out of the gate quickly in ’55 with a 7-2 record by June. Suddenly, he was struck by injuries and wasn’t even sure if he would make the World Series roster. A shoulder injury landed him on the disabled list. After coming back, he suffered another injury when the grounds crew at Ebbets Field accidentally crashed the batting cage into his ribs during pre-game practice. He finished the season with a 9-10 mark. And when he got the opportunity, Podres certainly made the most of it. In Game 3 at Brooklyn on Sept. 30, 1955, Podres celebrated his 23rd birthday with an 8-3 victory to set the stage for his Game 7 masterpiece. Coupled with his natural supply of self-assuredness, Podres proved to be too much to handle-even for the powerful Yankees who always saved their best games for October. In the final game, Podres scattered five hits for a 2-0 shutout over a stunned crowd at Yankee Stadium as the “Bums from Brooklyn” finally got their chance to celebrate. While Podres will forever be remembered for his 1955 World Series dramatics, he distinguished himself consistently over a 15-year major league career. Born in Witherbee, New York, where he grew up rooting for the Dodgers, Podres broke in with Brooklyn in 1953 when he was only 20. In 33 starts, he posted a 9-4 record. Except for 1956 when he served in the Navy, Podres pitched in the major leagues through the 1969 season. Upon returning from the Navy, Podres picked up right where he had left off. In 1957, he posted a 12-9 record and led the National League with a 2.66 ERA and six shutouts. He won at least 13 games in each of the next six seasons. In 1961, in just the Dodgers fourth season in Los Angeles, Podres posted an 18-5 mark and led the league in winning percentage at .783. He was traded to the Detroit Tigers during the 1966 season. He made 21 starts and had a 3-l record in 1967 when the Tigers took the American League pennant race to the final day of the season. Podres also is happy-and quite proud- about being elected to the Polish Sports Hall of Fame. Podres finished his career with a 148-116 record and 3.67 ERA. He appeared in four World Series and posted a 4-1 record and sizzling 2.11 ERA. So does his induction into the National Polish Sports Hall of Fame.